I (not so )secretly admire... | Primary Planet! Oh my goodness! It was really hard to choose just one, there are soooooo many wonderful bloggers out there! I am lucky enough to have met the amazing blogger that I "not so secretly" admire. What's more, we share the same first name! 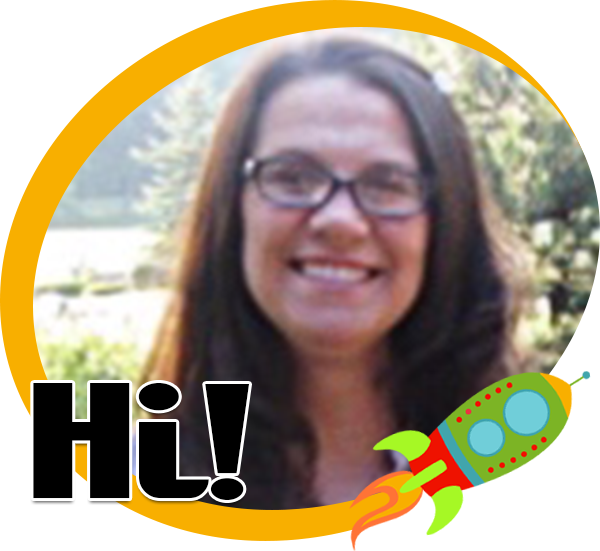 The blogger that I "secretly admire" is Hilary Lewis from Rockin' Teacher Materials. Have you been to her blog? It is AMAZING! I was lucky enough to meet Hilary last summer for a Blogger get together in Indiana. I was a little star struck I must say! So, when I signed up for this fun blog hop, I got to try out one of Hilary's products that she so generously donated! 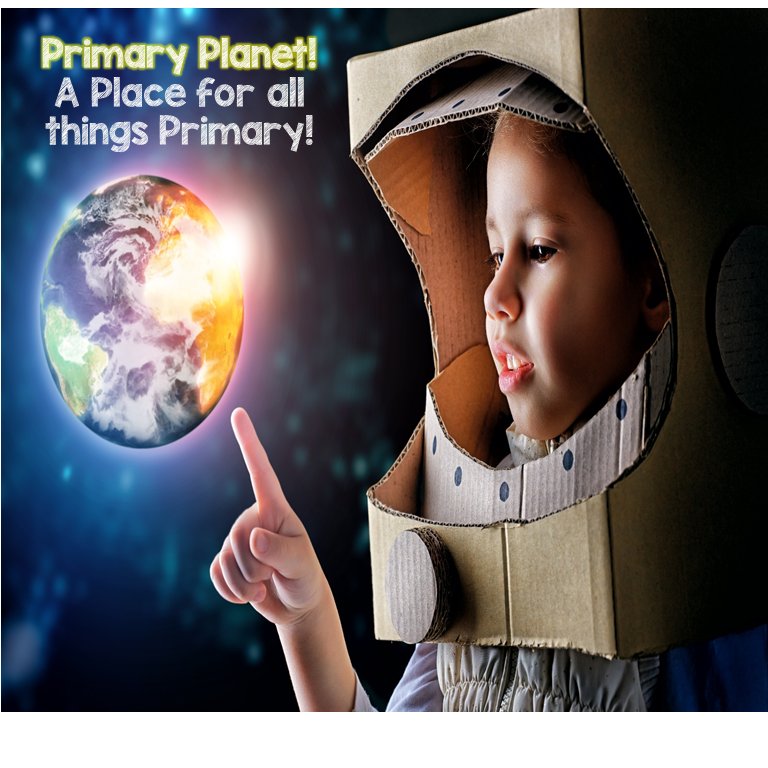 Click on the picture to see the preview of this amazing product! 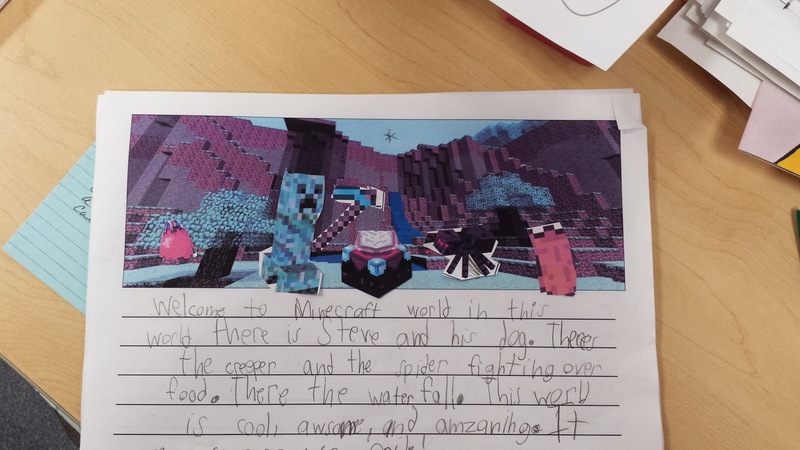 I don't know about your kiddos, but mine ADORE Minecraft. 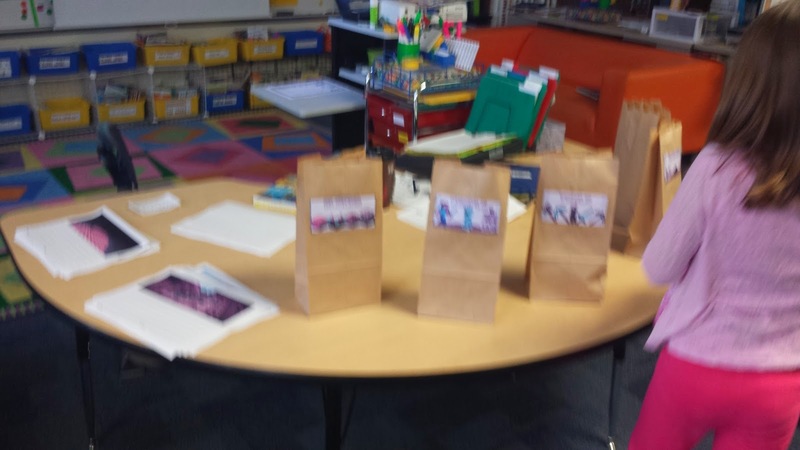 When I set up this product to use in my classroom, the kiddos were instantly interested and willing to listen to anything I had to say in order to get their hands on the materials! Hilary included instructions on how she set this up as a center in her classroom. I generally teach writing in a Workshop format, but it was soooo easy to adapt to my needs. 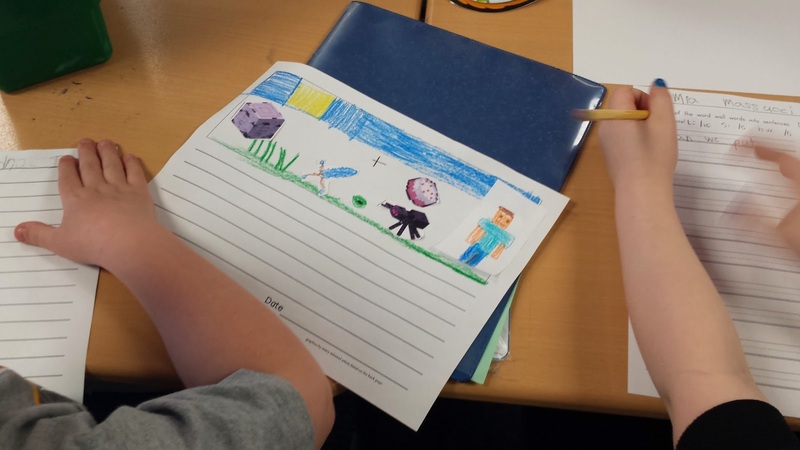 This product provides everything that the kiddos need to write an awesome Minecraft adventure. Here you can see how it worked in my classroom. This product comes with a "Create A Story" list to help walk the kiddos through the process. I left this page up on the Elmo on the days that we worked on our stories. I had everything on our front table. The kiddos started on the left and worked their way to the right. 1st, they chose a background paper. 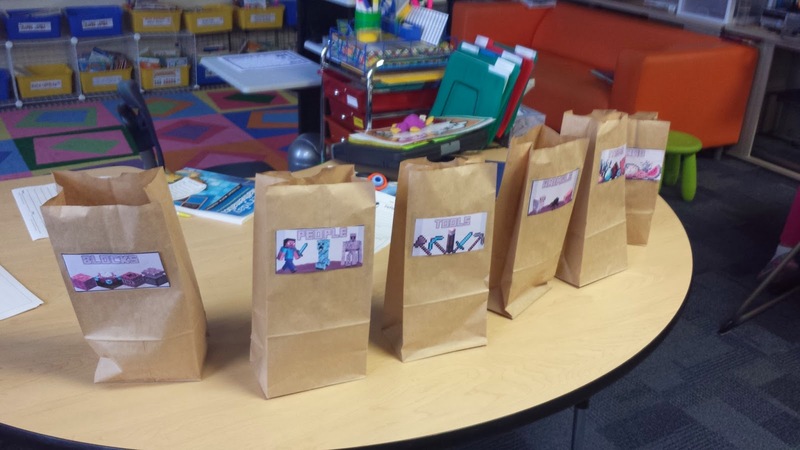 Then, they chose one item randomly out of each of the category bags: People, Food, Animals, Blocks, Items, and Tools. Then, they went and cut out the pictures that they chose to glue onto their colored background. Next, they took a blank page and wrote their story. Then, they used their editing checklists to check through their own stories. When they had checked their own stories, I did a little final editing. Then, they wrote their stories on their colored pictures. 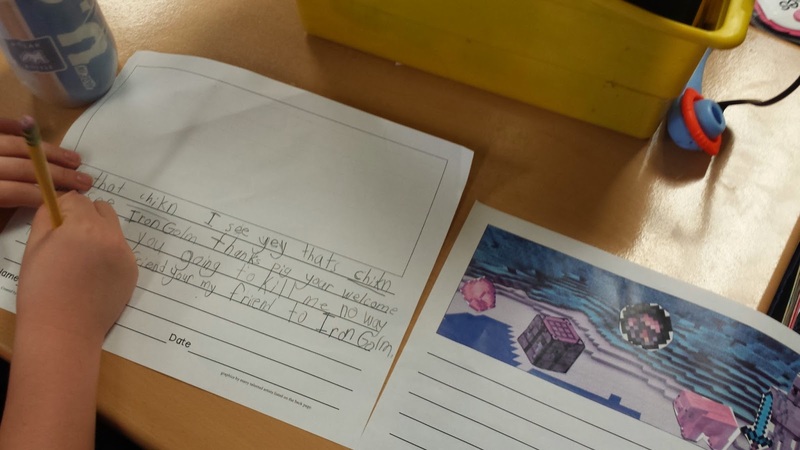 Last, but not least they shared their stories with the class. This motivated even my most unmotivated of writers! I was so impressed with how well they did and how excited they got! 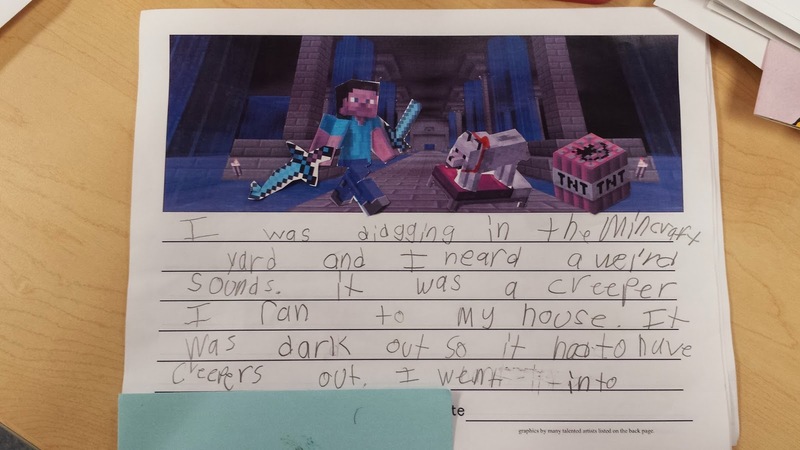 I has one kiddo who hates to write asking "Are we going to work on our Minecraft stories today?" It was writing magic! to put it away while he was writing his story! A few of our final products! This kiddo wanted to draw his own background! My girls even got really excited about this writing project! Click on the picture to take you to Hilary's store!